When I first clapped eyes on the Estée Lauder Topaz Collection courtesy of make up & Youtube guru Dustin Hunter, the Dramatic Teal Intense Kajal Eye Crayon almost lept from the screen at me. I'm a big fan of teal liners and an even bigger fan of kajal liners as they're so easy to use. Off I jolly well popped to Debenham's to have a little peek. As soon as the sales assistant swatched this beauty on her hand I knew I had to have it. It's soft, vivid and has the most beautiful formulation that gives you two minutes to blend out and wear as a shadow or leave as is and it will dry and not budge for the day. I'm absolutely in love with this product and have used it to recreate the stunning smokey peacock look by Sara over on Beaut.ie but have also used it in everyday wear. 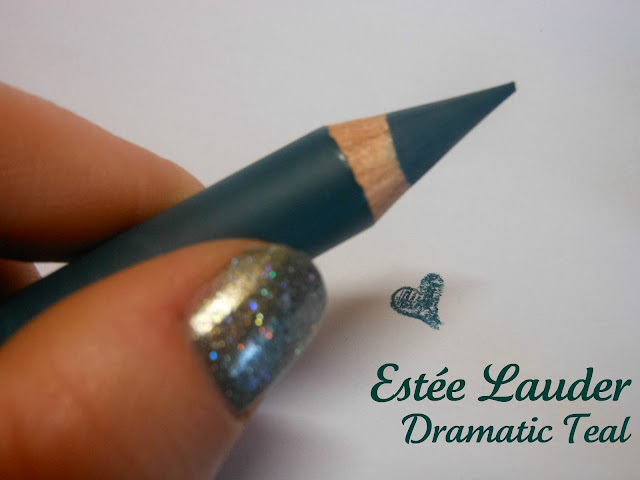 Although I have a huge fondness for Estée Lauder and their elegant ways, if €25 for a liner makes your eyes water I have found two beautiful tealy alternatives. Rimmel Soft Kohl in Jungle Green is €4.67 from Boots, it's soft and pliable and once in place stays put all day long. It leans more to the green side of teal but is a very flattering shade. Bourjois Kohl and Contour in Bleu Virtuose is €6.60, also from Boots, it's a vibrant teal that promises 16 hours wear and more than delivers. Bourjois is closer to the formulation of Estée's crayon as it can be smudged and blended before it dries for a softer look. So what do we reckon? Have you made any purchases from the Topaz collection? Is teal your thang? Wow I wouldn't think of buying something in this colour but it looks really rich and gorgeous! Good post! That is a gorgeous colour and I love the fact that you've found some dupes for it too.